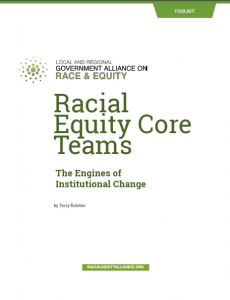 A Racial Equity Core Team is a primary leadership team responsible for designing, coordinating, and orga­nizing racial equity plans and activities across a government jurisdiction or institution that is committed to equitable systems change. The Core Team often serves as the engine for change, leading the way, pulling others along, chugging through sometimes challenging terrain, keeping things on track, moving a diverse community of people in a com­mon direction, and building the movement and momentum to arrive at the destination of equitable outcomes. This guide provides jurisdictions and organizations with the tools and strategies to establish and scale a cross-departmental Core Team, as well as case studies from GARE Network Members. For more information about creating a Racial Equity Core Team or to hear from GARE Members about their experiences as they build institutional capacity for change, please view our recent webinar (slides available here). This guide is published by the Government Alliance on Race and Equity, a national network of government working to achieve racial equity and advance opportunities for all. Authored by Terry Keleher, Director of Strategic Innovations, Race Forward.